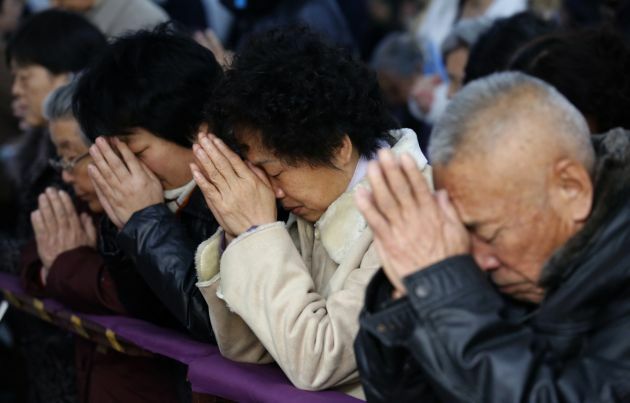 (Photo: REUTERS / Kim Kyung-Hoon)Chinese believers take part in a weekend mass at an underground Catholic church in Tianjin November 10, 2013. China's crackdown on places of worship and religious symbols has spread to schools. Authorities have shut down two Guandong kindergartens run by churches in the Guangxi Zhuang Autonomous Region. Police arrested four Christians who were running the schools for purportedly engaging in illegal business operations, the ChinaAid Association reported. Cheng Jie, who ran the Hualin Foreign Language Experimental Kindergarten in Liuzhou, Guangxi, was placed under criminal detention in February. He had been sent there to run the school by the Guangzhou-based Liangren House Church. Cheng was arrested along with a teacher, Mo Xiliu, who was later on released. Cheng's arrest had been approved by authorities in Liuzhou. Police arrested Li Jiatao, Huang Quirui and Fang Bin, all members of the Liangren House Church, in connection with Cheng'ss detention. The three were accused of selling a book published in-house that allegedly promoted Christianity among its students. A former pastor at Liangren House Church shared the threats being experienced by the families of their members who had been arrested. "They are under many threats. For example, they are not allowed to give an interview to reporters," former pastor Wang Dao said. "Ma Jiawen, Li Jiatao's husband has fled to Hong Kong. He said he dared not stay in Guangzhou as he was stalked." After the arrests, the Liuzhou Bureau of Education issued a notice of administrative penalty on Hualin Kindergarten for implementing a curriculum based on religious publications and reading materials. The agency said such actions violated the country's law on education because it allegedly forced citizens to believe in a religion. But Wang, who lives in the United Staes, disputed the accusation against the kindergarten staff, saying the textbooks in the school never had any mention of the word God or Jesus. "As for such a character education, you can say it's a doctrine of Christianity, Islam, Buddhism or even Confucianism. Honesty and trustworthiness are the universal values of mankind," Wang said. "All parents hope their children will become honest. However, the director of the [Liuzhou] Bureau of Education personally came to threaten [the kindergarten's directors]. If we teach, they will ban the kindergarten. This is absurd and hard to understand." In July, the church's Wisdom Heart Kindergarten in Wanning, Hainan had also been shut down for purportedly failing to pass an annual inspection. Wang said the shutting down of Wisdom Heart concerned him considering that it was the only school that failed the inspection out of some 100 kindergartens in the area. Wang lamented that other schools there had bad facilities, and yet those passed the inspection. He said Wisdom Heart catered to children of migrant workers. "We charge a very low fee, and we do it for the public good," Wang said.